Whether you want a designated office for running a business or a space for organising bills in the living room or landing, a home working space needs to be functional. The focus and most important furniture pieces are the desk and chair. Day to day what will be the purpose of the office? If you work from home a comfortable, yet stylish chair is important for physical comfort and wellbeing. I wanted a visually appealing chair that enables relaxed sitting and has good back support. Quality is not always determined by expense and my budget Ikea pick does the perfect job. Longer term I hope to invest in an ergonomic model office chairs from F&W. And your desk? Make sure you allow enough space to work, a sturdy, retro design works well, leaving enough room to move around. Offices come in many different shapes and sizes. Do you have limited space? Using the room efficiently is imperative. Consider your workflow and what items you need at your fingertips before investing in furniture. I have a LOT of paperwork and electrical gadgets.Cube, or drawer storage is a fun alternative to bookshelves, since each space can be used for decorative items or trays can be added to reduce mess. Not one for matching furniture I chose instead to favour the mixed simplistic Scandinavian style décor of the rest of the home. Lighting has a powerful aesthetic impact. You also need to consider the practicalities in terms of placement, to avoid creating screen glare from windows and ensure the room has enough light to avoid eye strain. Depending on how spacious your workspace is, you might also consider having multiple and different light fixtures to set a comfortable mood. 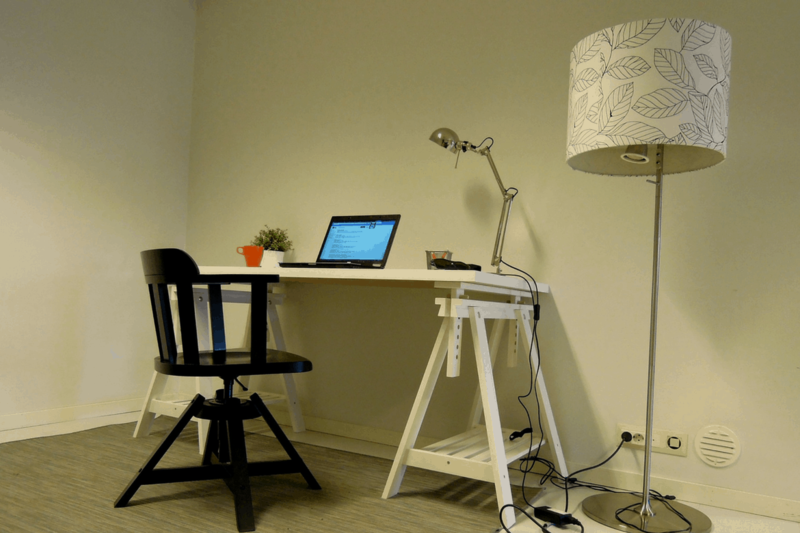 We chose dimmer spot lights and a floor lamp parallel to the desk for task lighting. Choose a location with some natural light and a view if possible. A neutral base colour scheme will be less distracting than bold wallpapers. ‘Office beige’ is not for everyone so calming shades like botanical green can offer alternatives. In a multi-functional room different elements are tied together with monochrome prints and splashes of bold primary colours, such as blue. For a contemporary look decoration should be clean, organised and minimalistic. Plants and photographs can be added to create a homely feel.>Hang inspirational prints on the walls, whether that’s your children’s framed artwork or a classic painting. Hide unsightly wires with tubing, cord winders or covers, reducing clutter. I am currently loving the copper trend. Create a cohesive statement by picking a metallic accent colour and using it throughout your office. How have you decorated your office, did you go bright and bold? Practical or stylish?